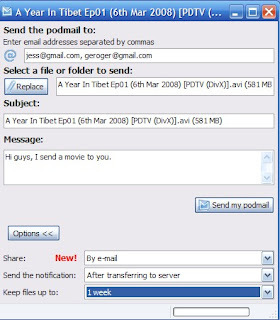 Podmailing is a kind of p2p client that allows you send and receive big file via BitTorrent style and by an email interface. Of course, you need install a software from Podmailing. You can send unlimited size file with an email compose interface, almost same, very simple. You can fill several receiver's email address, pick up a file or a fold, compose a brief note let receiver know that is you. You can choose sharing way: by email or web. When receiver can download, and how long that file keeping. After that just click "send your podmail" button. All done. Receiver will get an email with file download link from you. They can use three ways to download your file, one is use web browser; another one is use any BitTorrent client they have; last one is use Podmailing client if they have. 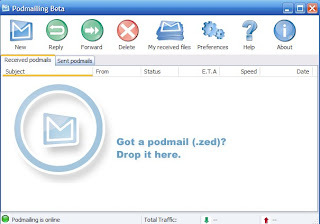 Some people had test speed of these three ways, result is use Podmailing client is fastest. Use BitTorrent client is next, and use web browser is a little bit slow but that depends on your local bandwidth. 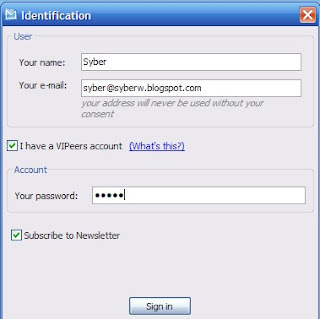 Now, Podmailing is belong to another p2p file sharing service - Vipeers now.